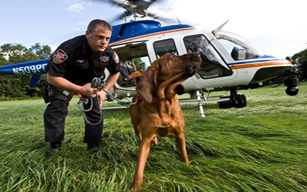 The Department of Public Safety has multiple teams comprised of a police officer/handler and a specially trained canine. The teams provide the department with the ability to detect virtually all types of explosives; detect a wide range of narcotics and track crime suspects or lost people. Each team is trained for a single, law enforcement purpose, for example, explosives, narcotics or arson detection, or tracking. The unit also has one of the nation's first electronic detection canines, trained to sniff out hidden or discarded electronic devices such as cell phones, thumb drives and SD cards that may contain evidence critical to a criminal investigation.